Cinnamon rolls are a prized breakfast possession in America, yet few families will attempt to make them from home. It’s understandable why. Who wants to wake up before the crack of dawn to let dough rise for several hours? Ahem, well maybe me, but I’m in the vast minority. Luckily, I’ve included instructions to prep certain items the night before, so the cinnamon rolls will be ready to eat (the morning of) in one hour. Like many Americans, I don’t have childhood memories of anyone in my family attempting to make homemade cinnamon rolls – just memories of the Pillsbury canisters popping open to unleash the leaven dough. However, I learned the magic behind homemade rolls when I started a job at a bakery in high school. Making the dough is fairly easy using a food processor. The hardest part is waiting the two hours to let the dough double. The moist, pliable dough rolls out to form a thin rectangular shape, which you slather with butter and cinnamon sugar. The cinnamon roll shapes are made by rolling the dough into a tight log, then cutting it into slices. As the dough bakes, your kitchen will be filled with the most excruciating scent that is sure to send even your farthest neighbors flocking. Once the buns come out of the oven, top them with the sticky cream-cheese icing. Watch it melt into every crevice of the steaming hot buns, and then get ready for everyone to take a dive for the spatula. Nothing compares to homemade cinnamon rolls. It’s mighty satisfying to unravel the seemingly infinite layers of the brioche-like bun to uncover the melted cinnamon sugar that has seeped into the buttery dough. While some people will add in nuts or top the buns with an orange glaze, I prefer to keep my cinnamon rolls this way – plain and simple – to evoke nostalgic memories of Winter mornings with my family. The dough, icing, and cinnamon sugar filling can be made the night before, so this recipe will only take an hour the morning you make the rolls. Store the icing as well as the dough in the refrigerator overnight. When you wake up, all you have to do is roll out and assemble the rolls, which takes 20-30 minutes – tops. Let the icing thaw slightly as you prep and bake the dough. To make dough: Combine flour, yeast, salt, sugar, and butter in a food processor. Pulse machine to cut butter throughout flour. Add eggs and pulse a few times. With machine running, slowly pour in 3/4 cup milk through feed tube. Process for about 30 seconds. Add more milk, if necessary, 1 tablespoon at a time, until mixture forms a slightly sticky ball. If dough is too wet, then add more flour, 1 tablespoon at a time. Turn dough out onto floured work surface, and knead by hand for about 5 minutes. Form a smooth, round dough ball, return it to the bowl, and cover with plastic wrap. Let dough rise in a warm area for 1 to 2 hours, or until it doubles in size. Alternatively, for a slow rise, store in refrigerator overnight (up to 6 to 8 hours). Preheat oven to 350°F. Melt 4 tablespoons of butter. Use a pastry brush to apply butter to the insides of a 9-by-13-inch casserole dish. In a separate bowl, combine 3/4 cup sugar and cinnamon. Set aside. To assemble: Turn risen dough out onto a floured surface, and roll dough out until it is 1/4-inch thick. Use a pastry brush to liberally apply melted butter all over the top. Then sprinkle cinnamon sugar mixture on top of dough, making sure to leave 1/4-inch borders without sugar. Spread sugar evenly around the dough using a plastic bowl scraper, and then press it into the dough using a fork. Use bowl scraper to help you roll the dough into a tight log. Slice it into 20 pieces (about 1/2-inch thick). Transfer dough pieces with bowl scraper (so cinnamon sugar does not pour out), and place them cut side up into prepared baking dish. Once all pieces are placed side by side, apply remaining melted butter on top of the dough with a pastry brush. Bake for 20-25 minutes, or until dough begins to turn golden brown on top. To ice: While dough is baking, whip butter and cream cheese together in a mixer. Add powdered sugar, and mix until all ingredients are incorporated. 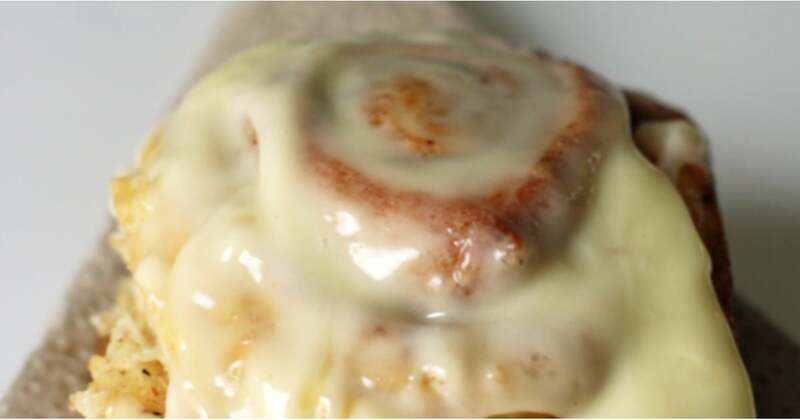 Pour icing over hot cinnamon rolls, and use a spatula to spread icing over cinnamon rolls. Serve immediately.